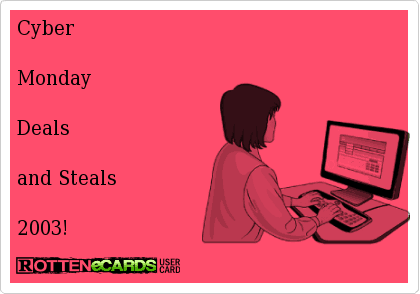 Some Popular Cyber Monday Deals and Steals Round-up! Aeropostale: $5 for T’s , Long sleeve T’s for $8, Hoodies & Sweaters for $10, Outerwear for $12, too much to list go check them out! American Eagle: Use Coupon Code: 50F13311 to snag 40% off Everything and Free Shipping. I ♥ Free Shipping! Banana Republic: Use coupon code to save an additional 40% off: CYBER ! The Body Shop: The whole site is on sale! 50% off and snag Free Shipping! Gap: Same as Banana Republic, Great deals and get 40% off using code CYBER! Jos. A. Bank: Their whole site is 50-60% off, and all Ship Free! Great time to nab your guy a great gift! Kohl’s: Use code CYBERSAVE to get 20% off and Free Shipping! You can also still earn $15 for every $50 spent! Macy’s: Extra 15% orders & free shipping! ( does not include furniture). Extra 10% off Select Home products. Use Coupon Code: CYBER. Extra 25% to 40% taken all clearance sale items, did I mention Free Shipping! Old Navy: Same as Banana Republic, Great deals and get 40% off using code CYBER!